Still amazed at how many people refer to the blog and/or twitter when in the shop but hopefully at least that means it is a good way to let people know what is happening. There are too many ifs and buts at the moment to make too clear a statement but I’m receiving offers all the time. I’ve had an offer to resurrect the Avalanche label by both licensing old albums and releasing new ones in what would be a worldwide deal. There has been a huge amount of interest from Aberdeen and some firm offers so I would be very disappointed not to have something in place in time for Record Store Day. Our first promotion with Cake Shop NYC is in place in conjunction with Rock Action and the first five “Avalanche Recommends” albums are being finalised. You will also see posters fairly soon in Edinburgh and Glasgow promoting one of our favourite albums thanks to the support of the UK’s leading poster company. So all well and good and there are plenty of other things in the pipeline too but what we really need to do is take money especially over the next two weeks so we can pay our bills/rent/rates etc. This will at least be helped by the release of the Springsteen and Mogwai albums but it will take more than that. The weekend was good and thanks to everybody who came along. Having said that it was a few key large sales that really helped boost the takings. It really can be precarious and it only takes ten people shopping for vinyl to decide to shop in town rather than come to the Grassmarket and at a couple of LPs each £300 is knocked off the potential takings. Add in other factors and just 20 people can make a huge difference. We should have been able to catch up to some extent over Christmas and New Year but bar a couple of days we were always way below last year. This year Edinburgh Council’s insistence on driving people towards Princes Street and St Andrew Square left the Grassmarket deserted even days before Christmas and surprisingly even before New Year. Of course some of our competitors not paying rent or for stock has had a big impact too. 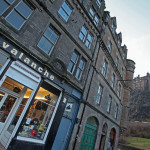 There is a possibility that Avalanche could remain in the Grassmarket elsewhere but it is hard to have confidence things will get better even after I had a positive meeting with the Grassmarket BID coordinator on Friday. Given just how poor footfall is currently there is a strong argument for having somewhere far cheaper that regulars and all our international customers can find easy enough and just not pay for footfall. What took me by surprise was several people suggesting we should look for investors and given all the potential things we had in place go bigger ! To be honest these last three years have often been enjoyable but hard work and I would really need good people in place to contemplate such a thing. A lot of people have asked how they can help but for now at least the answer has to be to buy stuff. We are not short of stock and in a way it sums up the problem that the kind of money we need to take over the next couple of weeks is no more than we take around Record Store Day weekend. We need to be busy every day so this week will really be make or break in seeing if that is possible. I will also add more to the online shop as people have been very supportive ordering online. Again many thanks for all the good wishes it is greatly appreciated.